Arthur Meltzer was born in Minneapolis, Minnesota in 1893. He began his first art training at the Minneapolis School of Fine Arts. After World War I, he pursued his art studies at the Pennsylvania Academy of the Fine Arts with Robert Kochler, Joseph Pearson, and Daniel Garber. In 1921, Meltzer won a Cresson European Scholarship from the Pennsylvania Academy of the Fine Arts which enabled him to travel to and study in England, France, Italy, Spain, and Holland. 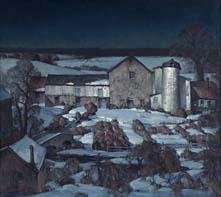 Meltzer retired from teaching in the 1940's and continued painting privately in his Huntingdon Valley residence where he spent thirty-seven years. Arthur Meltzer died at the age of ninety-five in July of 1989. His paintings vary in subject matter, ranging from painting to life drawing, to anatomy and portraiture. His painterly style reveals itself in his many still lifes as well as in his beautifully rendered landscapes of Bucks and Berks Counties and Mystic, Connecticut.